There is a tiny tug of war that sometimes takes place between me and my husband at mealtimes. Though we're both extremely open-minded eaters, when it comes to the food we really crave, he tends to lean towards European cuisine, while I prefer Asian. Tug of war is an exaggeration; we generally have no problems agreeing on what to eat. 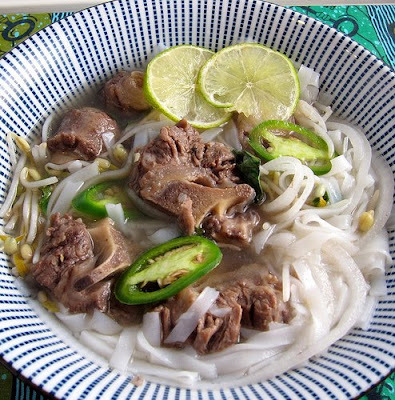 Still, it's nice to find a versatile dish like this oxtail soup, which is easily transformed into a delicious Italian meal one night, and an equally amazing Vietnamese meal the next. This was my first time cooking with oxtail, and I'm a huge fan of the results. A long, but mostly hands-free cooking time will turn this cheap cut into some of the most tender, succulent, moist meat you've ever eaten. I used my basic broth-making technique, but I pan-roasted the oxtail a bit first for extra flavor. This broth forms the backbone of the two simple soups I'll describe below. Ideally, you would make this the night before, to simplify the defatting process. 1. Rinse and dry the oxtail bones. Season with salt and pepper. 2. Heat the oil in a large, heavy-bottomed stockpot. Brown the bones in batches, about 5 minutes per side. Set oxtail aside. 3. Deglaze the pot with red wine. Then add the oxtail bones back in, along with any juices. 4. Cover bones completely with water. Add ginger and onion. Bring to a boil. 5. Skim off any scum that appears. Note: you should always skim scum off as soon as it appears. If the scum is allowed to remain in the broth as it cooks, it will give your soup a "dirty" flavor. 6. Turn heat to medium-low and simmer for 3-4 hours. Add water if necessary. Salt to taste, erring on the side of undersalted (you will be adding a salt component in both of the soup recipes below). 7. Discard ginger and onion. Remove the oxtail and store separately. 8. Refrigerate broth overnight. In the morning, remove the layer of congealed fat from the surface. If you are unable to make the broth ahead of time, you can remove most of the fat by skimming the surface of the broth with a spoon. 1. In a medium-sized saucepan, heat the olive oil and cook the sliced garlic for about a minute (do not brown). 2. 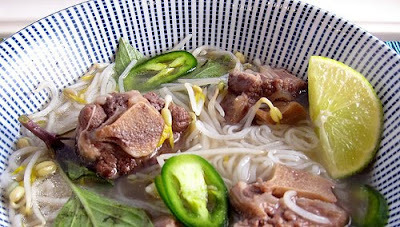 Add the broth to the saucepan, along with the meat from about 15 pieces of oxtail, the diced daikon, and the bay leaves. 3. Rinse the kale and and remove the stems with a sharp knife. Blanch briefly in boiling salted water. 4. Add blanched kale and drained can of white beans to the soup. Cover and continue cooking over medium-low heat until daikon is tender (about 20 minutes). 5. Remove the bay leaves, then season with soy sauce (about a tablespoon) to taste. Soy sauce will enhance the color of the broth. 6. Serve with nice, crusty bread. 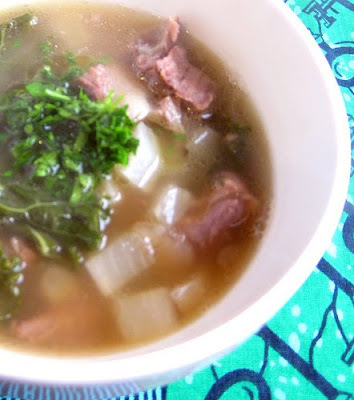 This soup invites endless variations: You could add barley or short pasta, substitute diced potatoes for the daikon, or replace the kale with either escarole or spinach. 1. Heat broth along with oxtail pieces in a medium-sized saucepan. Add about a tablespoon of fish sauce. 2. 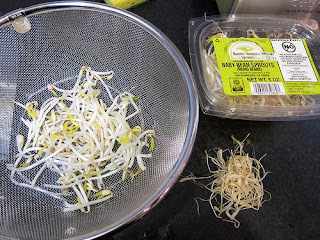 Clean bean sprouts with a thorough rinsing. Then snap off the yucky, threadlike root ends (see picture). 3. Soak noodles (if using dry noodles), or rinse and separate fresh rice noodles. Cook according to package instructions. Dry will probably take about ten minutes in boiling water, fresh cooks in about a minute. 4. 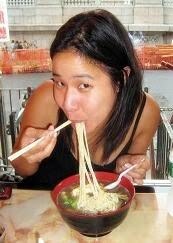 Drain noodles and place a bundle in the bottom of each soup bowl. Place a handful of bean sprouts and a couple rings of onion on top. 5. Slice jalapenos on the diagonal. Cut limes into wedges. Place on a plate along with the washed Thai basil. 6. Serve pho, allowing people to garnish their own bowls with basil, jalapeno, and lime. Add a dash of sriracha if desired. I found that the jalapeno (as long as you use a whole pepper) adds a surprising amount of heat, while still allowing the flavor of the broth to shine through.